Recently, the “internet of things” study by Gartner had revealed that world will have 26 billion internet connected devices in next 6 years out of which smartphones and tablets will account for nearly one-third of them. With such humongous growth in mobile devices, the growth in mobile advertising is expected to rise at fast pace as well. According to Gartner forecast, it will grow to $18 billion in 2014, from estimated $13.1 billion in 2013, a rise of about 37.5 percent year on year. The mobile advertising growth will grow even faster in following 3 years and will reach $41.9 billion by 2017. Though, the growth in mobile advertising will remain high over next few years, the mobile inventory available will be even higher according to the report. The ad spaces available in mobile apps and mobile websites is expected to grow much faster than advertiser demand. The in-app and mobile web display ads will continue to be the single biggest category of ads, however, the growth in mobile audio/video ads in next 5 years will be much higher than mobile display ads due to growth in larger screen tablet device growth. The report also predicts that location based ads will be increasingly preferred by local advertisers due to advantage of specific geo-targeting available with mobile devices. Though Asia Pacific region will have much higher number of mobile devices over next few years, North America will drive the maximum growth in mobile advertising due to sheer scale of advertising budgets by North American brands. Japan and South Korea on the other hand are currently the most mature mobile advertising markets in the world, and hence the mobile ad growth rate in those regions will be relatively slower, averaging 30 percent between 2012 and 2017. Though currently high-growth economies like India and China have very small market share, they will contribute increasingly to global mobile advertising growth as they have expanding middle class population who present attractive markets for global and local brands. Domestic Skies Explode With 50% Discount Offers by Airlines; Mum-Del Flight At Rs 2830 Only! M-AdCall: The Next Big Thing in Mobile Advertising? 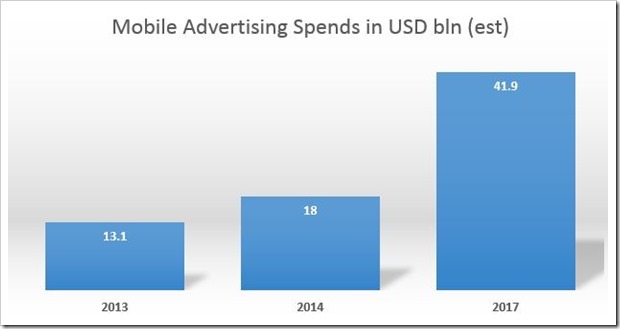 Mobile Advertising witnesses tremendous growth – Gen Y dominate usage!